Lactose intolerance is arguably one of the most misunderstood and misdiagnosed digestive conditions. Consumers as well as RDs know that lactose intolerance can cause gas, cramps, bloating, and diarrhea. But these symptoms are also common to many other digestive disorders, including irritable bowel syndrome, celiac disease, and inflammatory bowel disease. While clients may find it easy to point a finger at dairy and hope that removing all dairy products from their diet will solve the problem, RDs need to take a closer look at the clinical presentation before assuming lactose intolerance is the accurate diagnosis. At the National Institutes of Health (NIH) Consensus Development Conference on Lactose Intolerance and Health in 2010, lactose intolerance was defined as a syndrome of diarrhea, abdominal pain, flatulence, and/or bloating occurring after the ingestion of the milk sugar lactose. The symptoms result from lactose malabsorption, a decreased ability to digest lactose due to a deficiency of the enzyme lactase, which breaks down lactose into glucose and galactose. Lactose is normally digested in the small intestine, but when lactase levels are low, lactose is transported intact to the colon where intestinal bacteria ferment the disaccharides and cause the hallmark symptoms. The overwhelming majority of infants in every racial and ethnic group produce lactase sometime after weaning, but most will experience a genetically programmed decrease in the digestive enzyme, known as lactase nonpersistance. Although the NIH states there’s a lack of reliable estimates of the prevalence of lactose intolerance in the United States, a study in Nutrition Today found that in this country, 12% of those surveyed self-reported being lactose intolerant. Lactase nonpersistance is thought to affect more than 70% of the world’s adult population. The NIH states that a clinical diagnosis of lactose intolerance requires both documented lactose maldigestion and the presence of symptoms—for example, the onset of gastrointestinal symptoms following a blinded, single-dose challenge of lactose that doesn’t occur when the person ingests a placebo. Many people who self-report lactose intolerance show no evidence of lactose malabsorption. For clients who’ve been diagnosed with lactose intolerance, no cure exists. But there are several strategies or interventions available that may help them deal with the condition. • Reduced-lactose dairy products: Several products are on the market, such as Lactaid, Horizon Organic, and Dairy Ease lactose-free milk, in which the lactose is “predigested” (hydrolyzed). Lactaid also makes lactose-free ice cream, yogurt, cottage cheese, and eggnog, and Yoplait makes a lactose-free yogurt. These products typically contain between zero and 2 g of lactose per serving. • Consume with meals: Individuals with lactose malabsorption can tolerate larger amounts of lactose with meals and if small servings (1/4 to 1/2 cup) are distributed throughout the day. — Densie Webb, PhD, RD, is a freelance writer, editor, and consultant based in Austin, Texas. 1. Lomer MCE, Parkes GC, Sanderson JD. Review article: lactose intolerance in clinical practice—myths and realities. Aliment Pharmacol Ther. 2008;27(2):93-103. 2. Suchy FJ, Brannon PM, Carpenter TO, et al. NIH Consensus Development Conference Statement: Lactose Intolerance and Health. NIH Consens State Sci Statements. 2010;27(2):1-27. 3. Wilt TJ, Shaukat A, Shamliyan T, et al. Lactose intolerance and health. Evid Rep/Technol Assess. 2010;192:1-410. 4. Savaiano DA, Boushey CJ, McCabe GP. Lactose intolerance symptoms assessed by meta-analysis: a grain of truth that leads to exaggeration. J Nutr. 2006;136(4):1107-1113. 5. Jarvinen RMK, Loukaskorpi M, Uusitupa MIJ. Tolerance of symptomatic lactose malabsorbers to lactose in milk chocolate. Eur J Clin Nutr. 2003;57(5):701-705. 6. Is goat’s milk lower in lactose than cow’s milk? Academy of Nutrition and Dietetics website. http://www.eatright.org/Public/content.aspx?id=6442459036. Accessed February 14, 2012. • Start with small amounts. Recommend clients drink 1/4 to 1/2 cup of milk as part of a meal or a snack. If they experience no symptoms, they can gradually increase servings to 1 cup. Any more than that, and the likelihood of symptoms increases. • Try chocolate milk and yogurt. Research shows they may be better tolerated than other dairy products. • Include low-lactose cheeses. These include cheddar, Swiss, Colby, Monterey Jack, and mozzarella, which have less than 1 g of lactose per serving. • Sample lactose-free dairy products. They taste the same as other dairy products, although they’re generally more costly. • Take supplements. 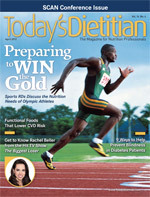 Clients who avoid dairy products completely due to a clinical or self-diagnosis must replace missing nutrients, especially calcium and vitamin D. If dairy products aren’t an option, recommend clients try fortified soy, almond, and/or rice milk, or calcium (1,000 to 1,300 mg) and vitamin D (600 to 800 IUs) supplements at age-appropriate levels. Suggest chewable calcium and vitamin D supplements for clients who have difficulty swallowing pills. 1. Savaiano DA, Boushey CJ, McCabe GP. Lactose intolerance symptoms assessed by meta-analysis: a grain of truth that leads to exaggeration. J Nutr. 2006;136(4):1107-1113. 2. Matlik L, Savaiano D, McCabe G, VanLoan M, Blue CL, Boushey CJ. Perceived milk intolerance is related to bone mineral content in 10- to 13-year-old female adolescents. Pediatrics. 2007;120(3):e669-e677. 3. Parson TJ, van Dusseldorp M, van Der Vliet M, van de Werken K, Schaafsma G, van Staveren WA. Reduced bone mass in Dutch adolescents fed a macrobiotic diet in early life. J Bone Miner Res. 1997;12(9):1486-1494. 4. Du XQ, Greenfield H, Fraser DR, Ge KY, Liu ZH, He W. Milk consumption and bone mineral content in Chinese adolescent girls. Bone. 2002;30(3):521-528. 5. Wilt TJ, Shaukat A, Shamliyan T, et al. Lactose intolerance and health. Evid Rep/Technol Assess. 2010;192:1-410. • Lactase nonpersistence (lactase insufficiency): This is a drop in lactase activity that occurs with age. Lactase activity in the small intestine of adolescents and adults is a fraction of that in infants. • Lactose malabsorption (lactose maldigestion): This occurs when a large portion of a dosage of lactose isn’t absorbed in the small bowel and is transported to the colon. Lactose malabsorption is best diagnosed with hydrogen breath tests. The presence of lactose malabsorption doesn’t necessarily translate into symptoms. • Lactose intolerance: This happens when malabsorbed lactose produces symptoms (eg, diarrhea, abdominal discomfort, flatulence, bloating). The presence of symptoms and their severity are determined by the quantity of lactose ingested. Source: Heyman MB; Committee on Nutrition. Lactose intolerance in infants, children, and adolescents. Pediatrics. 2006;118(3):1279-1286.